Between Fira and Imerovigli, you will find the amazing Firostefani one of the places that offer you the best views to the island. It might be considered a village but Firostefani has a variety of hotel accomodations covering every taste and need and a wide variety of places to eat and enjoy your drink. A quiet village with exceptional views to the caldera it seems like you will fall in love with Firostefani. ]The sunset is here as well one of the basic attractions, a sure paradise for the romantics and not only. 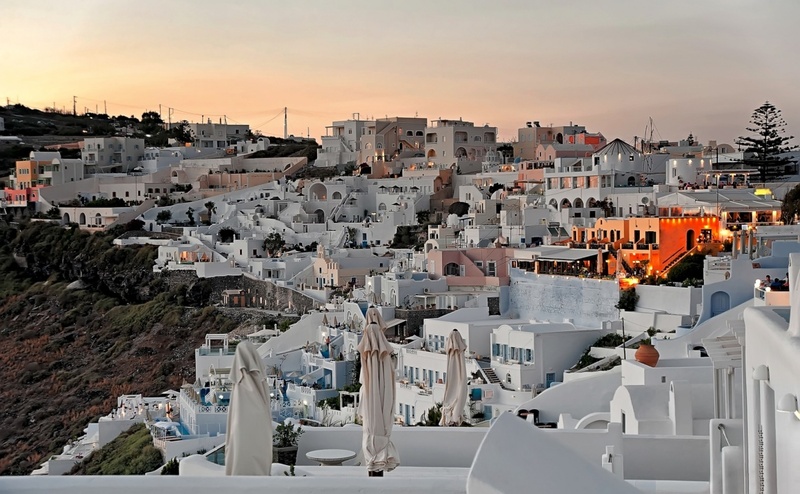 If you are wondering why visit Firostefani- the old village of Fira- then consider that this traditional village on the north side is something like one thing with the busy and vibrant Fira, or differently put the heart of the island! 'Crown of Fira' is the meaning of the village’s name as it is higher than Fira and as it is only logical the view from Firostefani are exceptional and the amazing thing is that here you realize how you can look at once the volcano and the city! Firostefani is the area situated above Fira, which offers an amazing view to the capital and the sea, giving the traveler the chance to admire an of unbelievable beauty landscape Both Fira and Firostefani offer an abundance of dining and nightlife opportunities as Fira is the heart of the city and of course the busiest place of the island. Firostefani is more quiet and has maintained its traditional character making sure that its guests will enjoy their privacy and tranquility above all but offers you the chance to enjoy all the modern facilities as you are offered a variety of options. A wide range of hotels, apartments, studios, rooms for rent and villas are offered for your Santorini holidays in Firostefani and you only have to find those that will cover your every need! Find information about selected Hotels, apartments and rooms in Firostefani to choose the perfect place for your accommodation. ©2019 - santorini-island.com All Rights Reserved.